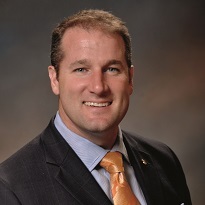 Jon McGavin is the General Manager of The Ritz-Carlton Orlando, Grande Lakes. In this position he oversees operations of the hotel, which includes 582 guestrooms, a 40,000 square foot spa, over 110,000 square feet of indoor and outdoor meeting space and an 18-hole championship golf course designed by two-time British Open winner and PGA Tour icon Greg Norman. A veteran of the hospitality industry, McGavin has been with Marriott International for 20 years and this appointment marks his return to Grande Lakes Orlando. McGavin began his career in the food and beverage division at the company’s beachfront resort in Amelia Island in 1991 and moved to The Ritz-Carlton, Atlanta just in time to experience the excitement of the Summer Olympics in 1996. Two years later, he moved to The Ritz-Carlton, Cleveland as food and beverage director and then held the same role at The Ritz-Carlton, Marina del Rey in Southern California. After opening The Ritz-Carlton Orlando as food and beverage director in 2003, he was promoted to hotel manager in 2005. In 2007, McGavin had the opportunity to lead the team at The Ritz-Carlton, Buckhead as general manager before returning to Orlando in 2011 to accept his current position. Mr. McGavin holds a Bachelor of Science in Hotel and Restaurant Management from the University of Georgia.